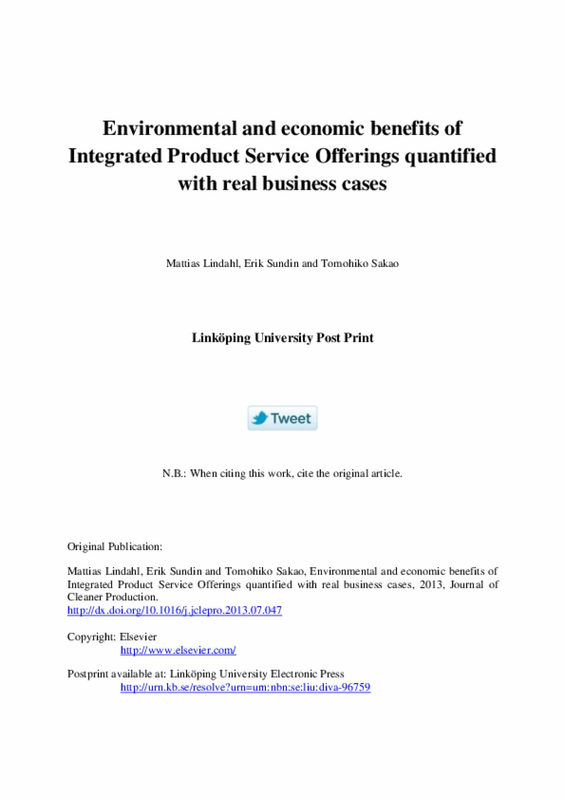 This paper quantifies environmental and economic benefits of the Integrated Product Service Offering (IPSO) in real practice from a life cycle perspective, in comparison with its corresponding product-sales type business as a reference. The paper also discusses the engineering activities contributing to those effects, as well as their enablers. To reach this goal, the paper investigates three IPSOs as real-life business cases in industry. Those cases are selected from different sectors and have different characteristics. In addition, the paper calculates and compares environmental impacts and economic costs of different offerings in each case through the use of Life Cycle Assessment and Life Cycle Costing, respectively. In all three cases, IPSOs had environmental and economic advantages in comparison with the product-sales type business. The engineering activities contributing to those advantages under IPSOs were recycling, remanufacturing, reuse, maintenance, and holistic planning and operation. The enablers were found to be high flexibility for realizing products and services and close relationships with relevant actors.